Bedbugs are hard to control. It is best not to try to treat the problem yourself as this often does not work.We offer professional treatment for bedbugs. We will tell you exactly what you need to do before the treatment. You must follow this advice, so that the treatment can work as well as possible.One treatment is usually enough. When we finish the treatment we will explain what we have done and tell you what you need to do to stop the problem in the future. 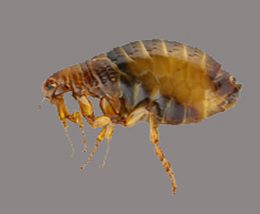 Fleas live on the blood of warm-blooded animals. There are many types of flea and each prefers its own animal ‘host’, but they will feed on other types of animal, including humans. The human flea and dog flea are now rare in this country, and we are usually bitten by cat fleas. There are two types of cockroach commonly found in Britain, the German cockroach and the oriental cockroach. 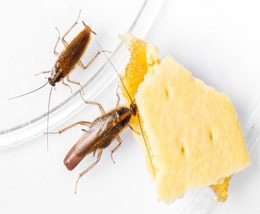 Both are pests.Cockroaches can spread disease by infecting our food and coming into contact with worktops and kitchen utensils.They eat our food but spoil much more with their droppings, cast skins and dead bodies. They breed and spread quickly. Mice pose a significant health risk because they may carry a number of serious diseases which can be transmitted to humans. The most serious of these are Salmonella food poisoning and Toxoplasmosis. 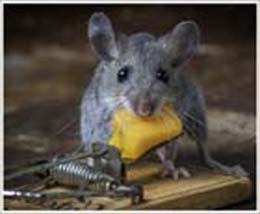 Mice also infest and contaminate food with urine and droppings and can also cause minor damage to buildings by their habit of gnawing. Rats pose a significant health risk; they can carry a range of serious diseases which can be transmitted to humans. The most serious of these are Weil's disease, Plague, Salmonella food poisoning and Toxoplasmosis. 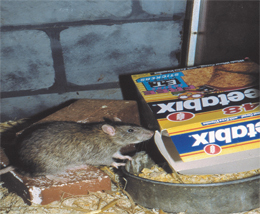 Rats also infest and contaminate food with urine and droppings, and can also cause structural damage to buildings by gnawing through timbers, pipes, cables and other building fabrics. 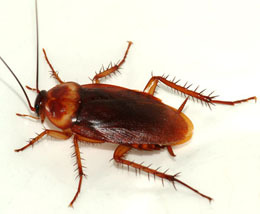 Cockroaches pose a health risk because they can infect foodstuffs with a range of diseases such as food poisoning, dysentery, typhoid and polio. Apart from disease carrying they also render food inedible by transferring dirt and filth from their bodies and feet onto food and food preparation surfaces..
Apart from the biting flies, all species feed by vomiting saliva on to the food surface, and sucking up the resulting liquid. 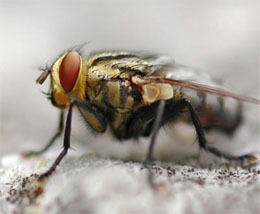 In the course of doing so, the fly contaminates the food with bacteria from its gut and its feet. Thus, it may transmit food poisoning, dysentery, typhoid or cholera in countries where these occur. 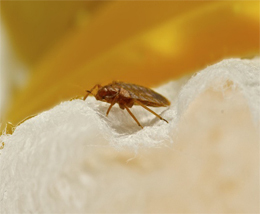 The eggs of parasitic worms may also be carried by flies. The common wasp (Vespula vulgaris) is about 15 mm in length with a distinctive yellow and black banding. The queen wasp, somewhat larger than the worker, emerges from hibernation in the spring and begins to build a ball shaped nest of about 2-3 inches in diameter. The nest is made from chewed wood pulp which is laid down with a very fragile paper-like outer shell. 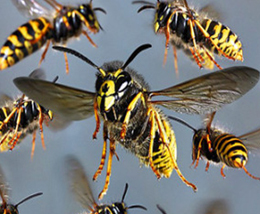 The few initial cells in the original golf ball size nest are expanded throughout the summer as the queen wasp continues to lay eggs and the emerging adult worker wasps take on the nest building to accommodate the growing colony. 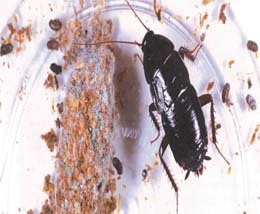 The Oriental Cockroach is dark brown/black and is 20 to 24mm long. Immature stages of Cockroach, look exactly like adults, just on a smaller scale.The Oriental Cockroach deposits its 13mm long egg capsule on packaging, sacking or in suitable dark crevices, before the 16 to 18 nymphs hatch around 12 weeks later. They grow in stages, from nymphs to maturity in 6 to 12 months for the Oriental Cockroach, and 6 to 12 weeks for the German Cockroach. 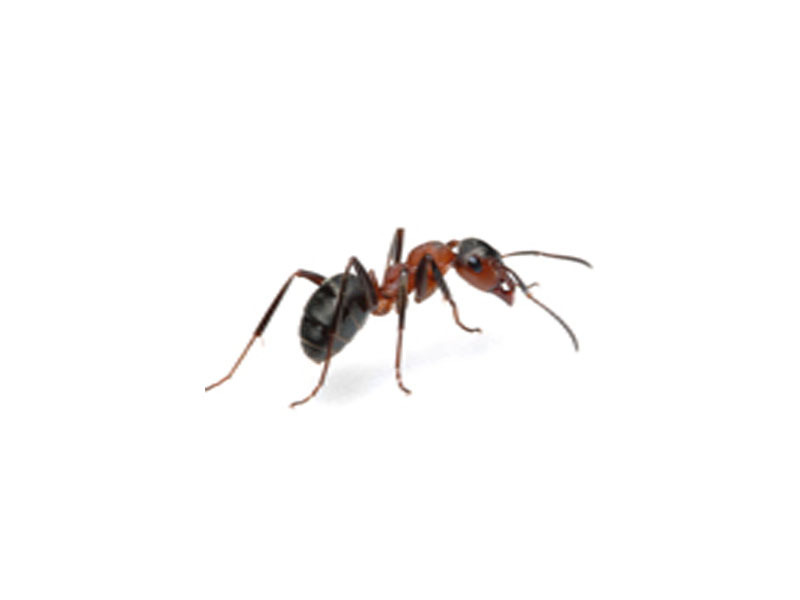 The common black garden ant (Lasius niger) is not considered a risk to public health, however from time to time they can become a nuisance. They are dark brown or black in colour and3-5 mm in length. They generally live outside, but will often invade buildings in search of food and this is when they can be a nuisance. Have you heard something rustling in your attic or loft and suspect squirrels? As adorable as squirrels might be, they can be an incredibly destructive and distressing pest to have in your home or work.